Sooner or later you’ll need to get the rear shock, whether it’s to replace it or to inspect or replace the linkage bearings. Here’s how to do it. There isn’t enough clearance to remove the shock with the bike on the centre stand, so you need to create some room either above the shock or below it. This job is relatively straightforward as long as you’re methodical (and have access to a garage!) and there are instructions in the workshop manual, but the two methods outlined below are based on owner experience. As the name suggests, this involves stripping down everything and removing the sub frame so as to give the shock the extra clearance it needs. Apriliaforum member Bikpaintr produced a guide to removing the shock that details the process. Use this link to download a PDF version of the guide. This one’s a lot simpler but the bike can be a lot less stable, so choose your blocks carefully! 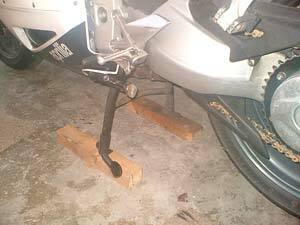 This method, pioneered by Northern Phil, involves placing two blocks under the bike and lifting it onto the centre stand with the blocks under the feet as pictured right. 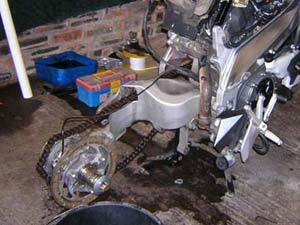 Raising the bike in this way creates the extra space to allow you to get at the bolts and remove the shock quickly.